It stopped us dead in our tracks in the main plaza of Oaxaca, Mexico. 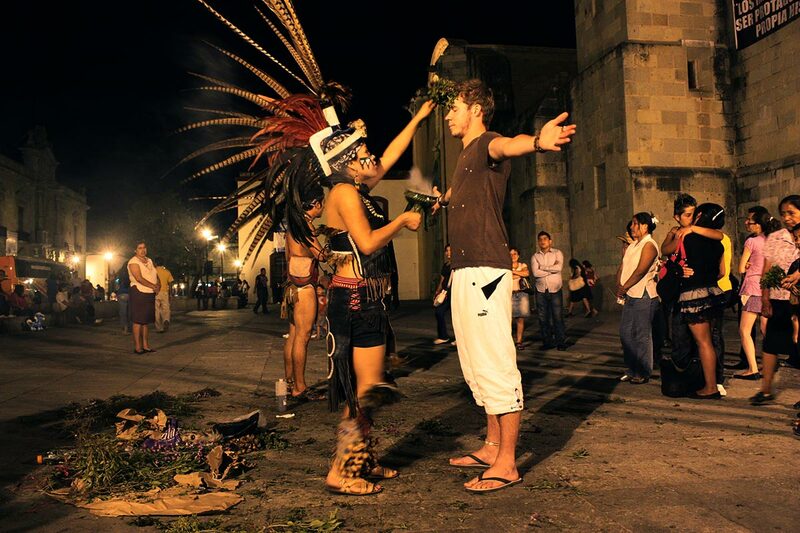 It’s not every day you see an ancient Aztec cleansing ritual in the flesh. One by one, onlookers bravely walked forward, faithfully opening their arms, closing their eyes and taking the plunge. A shaman, dressed in traditional Aztec clothing—enormous head feathers, an embroidered leather outfit, geometric face paint and adorned rattling sandals—took care of the rest. She held a small bunch of herbs and was burning incense in an embellished metallic chalice. I hesitated, but my friend Marc stepped up. She started rubbing his head with the herbs, then his arms and legs. Finally, she blew smoke into his face and instructed him to step on the herbs to conclude the ceremony. A limpia is supposed to cleanse one’s aura of negative energies and improve their communication with the spirit world. I’m not sure Marc knew exactly what he was signing up for. In a place like Mexico, where so much attention is placed on death, it’s important to make sure that when you live, you live a good, clean life. Dressing up for the Day of the Dead. The Day of the Dead (Dia de los Muertos) is a UNESCO-protected event that takes place every year from October 31 to November 2, so grand that preparations happen year-round. Rituals honouring the dead in Mexico can be traced back as far as 3,000 years to pre-Columbian cultures like the Zapotecs, but the modern-day version of the Day of the Dead has its roots in the Aztec civilization. Their month-long festivities celebrated the post-mortem goddess Miccailhitonitl (“Lady of the Dead”) who protected the bones of the dead. The Spanish colonization of the Aztec Empire blended those beliefs with the back-to-back Catholic holidays of All Saints’ Day and All Souls’ Day, and that’s how the Day of the Dead was, well, born. And now, some of the biggest celebrations in the country take place right here, in the area around Oaxaca, a city south of Mexico City that mixes Spanish and native cultures, with its green-stoned colonial buildings and nearby indigenous archaeological sites. I ended up in Mexico when Marc decided to buy a van in Vancouver and head south of the borders. As soon as I could, I packed my bags and bought a one-way ticket to Mexico City. We road-tripped for weeks in his beat-up old van, hoping that his brakes didn’t fail us—all this talk about death starts making you a little nervous (not to mention Montezuma’s revenge, which nearly took us both out shortly after). By sort-of coincidence, just before the trip, I had visited a Day of the Dead–themed art show and discovered Cielito Lindo Estudio. 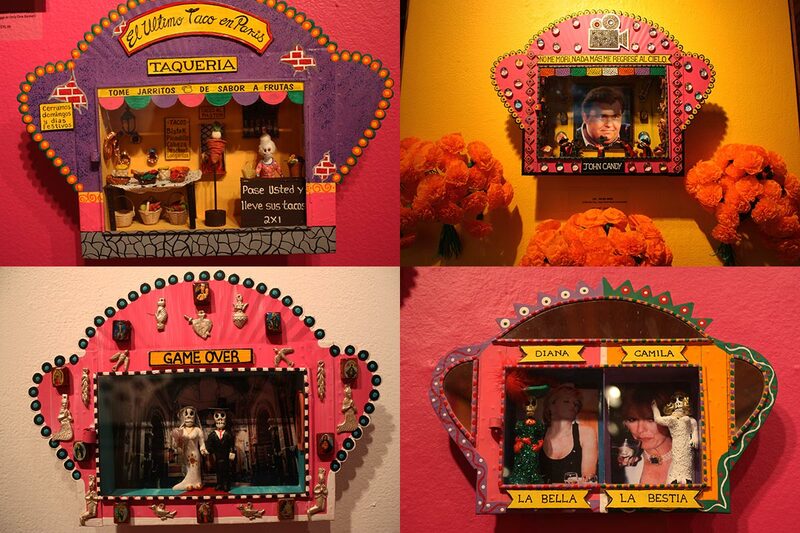 Based in Mexico, the artist and founder, Jose Antonio, produces internationally renowned nichos, shadowboxes with Day of the Dead themes. 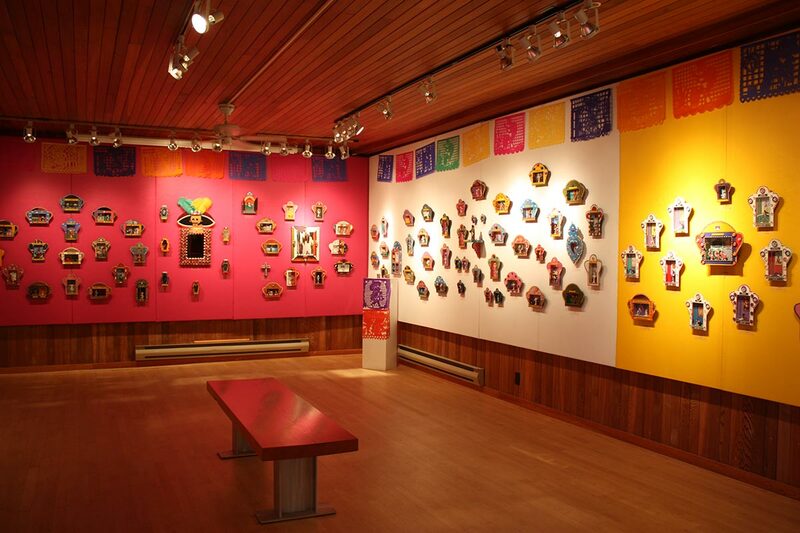 The outsides are meticulously hand-painted with bright Mexican motifs, but the insides are far from traditional. Each nicho carries miniature and detailed skeletons inside, engaged in everyday activities. The juxtaposition between the dead and the living is part of the fun. In Oaxaca, there were nods to Day of the Dead everywhere I looked—flags of papel picado (perforated tissue paper) with skeletons packed the streets, while sugar skulls got windowfront displays. The designs were never scary, but often whimsical. “The Day of the Dead is full of energy and tradition,” Jose Antonio told me. Instead of focusing on the negative part of death, his nichos, much like the festivities, are bursting with life. His formula is to come up with a humorous (and often tongue-in-cheek) phrase and then develop it using anything from cigarette packages to recycled glass and tin. He also uses wood, metal, ceramics and finishes them with sequins, glitter and little trinkets, such as religious folk charms and beads. Traditionally, nichos are hung indoors to bless the house. 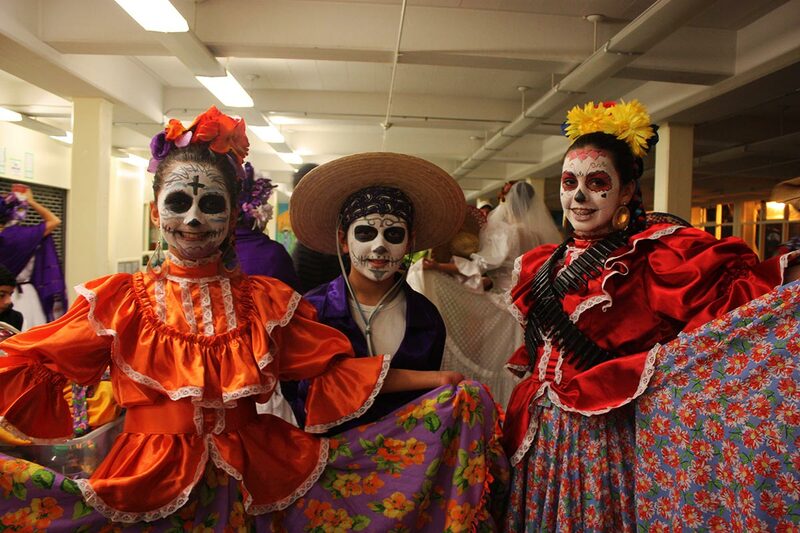 In terms of the actual celebrations, the Day of the Dead manages to be respectful and festive at the same time. “Many people make their ofrendas (altars) at home, celebrating the members of the family that have passed away,” he says. The ofrendas include their loved ones’ favourite foods, photos, candles, flowers (especially marigold, as the strong perfume is thought to attract spirits) and pan de muerto (bread of the dead—sweet rolls decorated with bone shapes). Of course, it’s never a proper ofrenda without adding Mexico’s most spirited and deadly beverage: tequila. In the belief that souls return to visit once a year, people make sure to give them a warm (and boozy) welcome. Many choose to visit the departed in cemeteries—well into the night—and make their ofrendas there. There are also the lively face-painted, costumed street parades and parties, where musicians and revellers sing and dance in an all-night bender, as a way to honour death by extravagantly celebrating life. From Oaxaca, we day-tripped to neighbouring Mitla, a village with the most important Zapotec religious ruins. There are unique and intricate mosaic carvings that cover tombs; the name “Mitla” actually derives from the word dedicated to the dead and the underworld. In Zapotec culture, death is often represented as a skull and is considered just another stage of life. So after witnessing the strong and long-standing ties to death in Mexico, it made sense that we had stumbled upon the limpia ritual in Oaxaca. That night, when the smoke cleared from the square, the living were free to start over again with a clean slate. And so they dispersed, carrying the humble understanding that, in the spirit of Mexican tradition, death is and always will be an extension of life. Then Marc and I dispersed, yearning to talk about our soul-shaking experience, over yet another death-defying street taco.